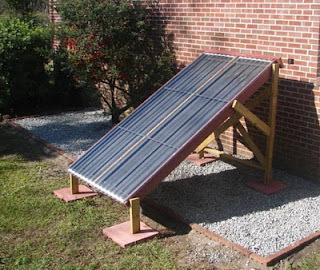 This is a very nicely done thermosyphon solar water heating system. 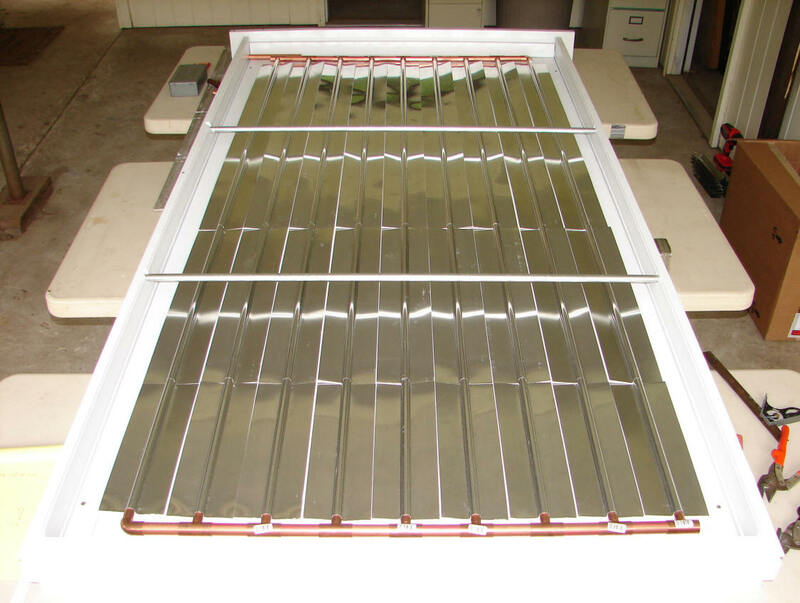 Thermosyphon systems use the lower density of the water heated by the collector to drive water circulation around the collector and tank circuit. 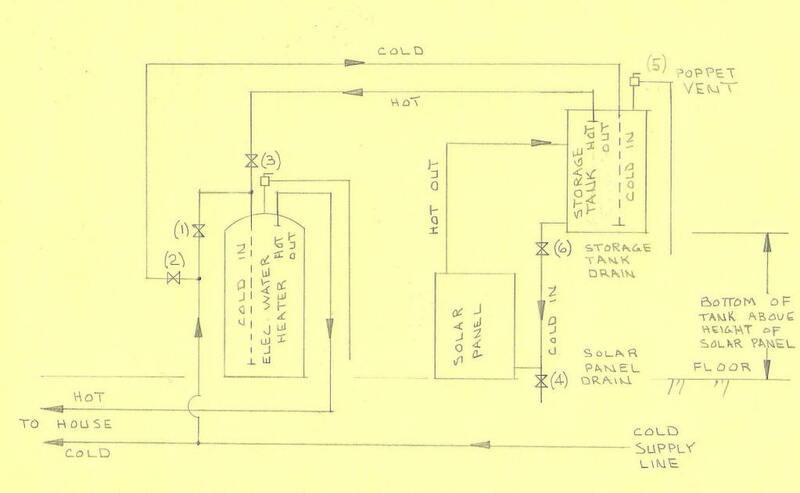 The systems are simpler than most solar water heating systems in that the need for both a circulation pump and a controller are replaced by the thermosyphon natural circulation. 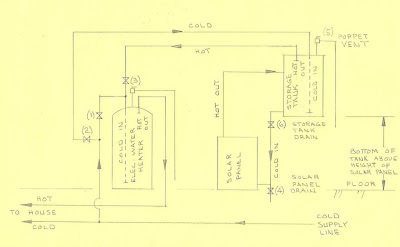 As the schematic above shows, the only conponents of the system are the collector, the storage tank, and the connecting plumbing -- sun and gravity takes care of the rest. The system is simpler, less costly, and lower maintenance than most solar water heating systems. Lonnie did a very nice job on this system, and provides full construction detail. While the collector construction follows the general design of the $1K collectors, Lonnie includes some new wrinkles in the collector that should improve performance. The tank must be above the top of the collector. This allows the hotter water in the collector to rise upward into the tank. It also automatically shuts off the circulation when the water in the collector cools below the tank temperature. The plumbing between the collector and tank must slope upward toward the tank. And, since the thermosyphon forces driving the flow are relatively weak, the collector and connecting plumbing should have low flow resistance. This thermosyphon design does not include freeze protection, so is only for situations in which no freezing weather occurs, or the collector can be drained for the winter. There are thermosyphon designs that circulate antifreeze through the collector and use a heat exchanger to transfer the collector heat to the storage tank. If you can meet the above criteria, the thermosyphon systems are a good choice for simple, cost effective, and maintenance free solar water heating. The new water heater "Back up" that was used. I own one and only need to turn it on every two days for 4 hrs in the summer. The unit is vary well insulated and is located in a basement,I do not have a solor heating sorce to date. Two shower's and dishes are done a day. Rheem lists the tank as having an energy factor of 0.92, meaning the standby losses are about 8% -- seems pretty good -- but, most of the newer electric tanks do have low standby losses.